Sir William Macewen (1848-1924) carried out surgery using this operating table at the Western Infirmary in Glasgow. 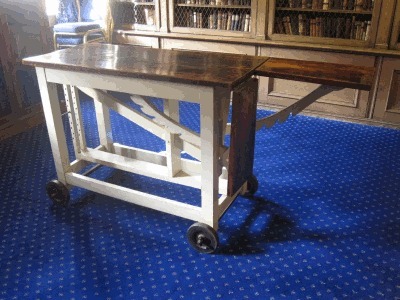 The table, which is wooden, is mounted on wheels and has a mechanism enabling it to be raised at one end. It was discovered by a porter in an old storeroom in the McKelvie Hospital, Oban and was presented to the College by the Board of Management for Oban and District Hospitals in 1954. Sir William Macewen was a surgeon who attempted operations which had never been done before. His work can be divided into three broad categories: surgical cure of hernia; surgical solutions for problems of the bones and joints; and surgical solutions for afflictions of the central nervous system. In 1874 Macewen became a Fellow of the Faculty of Physicians and Surgeons of Glasgow and in November of the same year he was appointed to the staff of the Glasgow Royal Infirmary. This appointment marked the beginning of a period of great activity and illustrious achievements. As a former student of Lister's, Macewen moved beyond Lister's precedents by seeking to create the ideal germ-free conditions in his operating theatre. Macewen's scrupulous attention to detail involved the meticulous preparation of his own hands and arms before surgery, and those of his nurses and assistants. For surgery he dressed in a gown which could be sterilised between operations, to the derision of many of his contemporaries. Sir William Macewen had his own instruments made, formed from a single piece of steel, in order to ensure that they were fully sterile. When Macewen was working at the Royal Infirmary his nurses purchased a fish kettle to be used for sterilising instruments, after the hospital authorities had refused to fund a container for the purpose. In 1892 Macewen became Regius Professor of Surgery at the University of Glasgow and transferred his surgical activities from the Royal to the Western Infirmary. In 1913 he became an Honorary Fellow of the Faculty of Physicians and Surgeons of Glasgow. 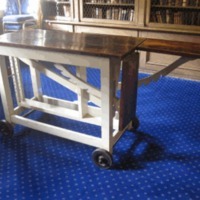 “Operating Table used by Sir William Macewen,” Heritage, accessed April 23, 2019, https://heritage.rcpsg.ac.uk/items/show/108. Description: Sir William Macewen (1848-1924) carried out surgery using this operating table at the Western Infirmary in Glasgow. The table, which is wooden, is mounted on wheels and has a mechanism enabling it to be raised at one end. It was discovered by a porter in an old storeroom in the McKelvie Hospital, Oban and was presented to the College by the Board of Management for Oban and District Hospitals in 1954. Sir William Macewen was a surgeon who attempted operations which had never been done before. His work can be divided into three broad categories: surgical cure of hernia; surgical solutions for problems of the bones and joints; and surgical solutions for afflictions of the central nervous system. In 1874 Macewen became a Fellow of the Faculty of Physicians and Surgeons of Glasgow and in November of the same year he was appointed to the staff of the Glasgow Royal Infirmary. This appointment marked the beginning of a period of great activity and illustrious achievements. As a former student of Lister's, Macewen moved beyond Lister's precedents by seeking to create the ideal germ-free conditions in his operating theatre. Macewen's scrupulous attention to detail involved the meticulous preparation of his own hands and arms before surgery, and those of his nurses and assistants. For surgery he dressed in a gown which could be sterilised between operations, to the derision of many of his contemporaries. Sir William Macewen had his own instruments made, formed from a single piece of steel, in order to ensure that they were fully sterile. When Macewen was working at the Royal Infirmary his nurses purchased a fish kettle to be used for sterilising instruments, after the hospital authorities had refused to fund a container for the purpose. In 1892 Macewen became Regius Professor of Surgery at the University of Glasgow and transferred his surgical activities from the Royal to the Western Infirmary. In 1913 he became an Honorary Fellow of the Faculty of Physicians and Surgeons of Glasgow.